?Do I need surgery for capsulitis? ?What does recovery from foot surgery involve? ?When is foot surgery necessary? Some things don’t get better on their own unless you take action. That pile of laundry in the corner of your bedroom isn’t going to wash itself, and the garbage isn’t going to haul itself to the curb, either. 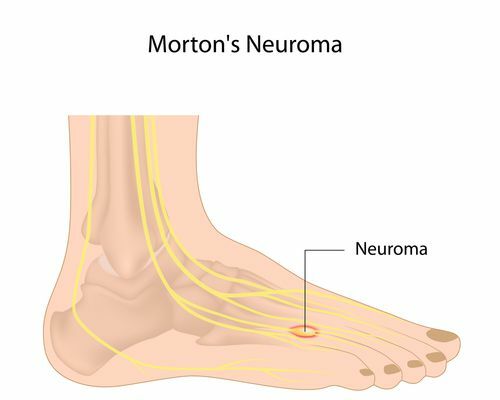 So it is with Morton’s neuromas—masses of thickened tissue that build up near the base of your toes, in the ball of your foot, and put painful pressure on nearby nerves. The condition is progressive, meaning without treatment the problem will only stay the same or get worse. Situations where conservative treatments, such as arch supports, metatarsal pads, cortisone injections, laser treatments or full custom orthotics do not adequately address your discomfort. Situations where the neuroma is quite large—conservative therapies tend to work better when the bump is smaller. Situations where pressure on the nerve is causing pain or discomfort that is particularly intense, or causing numbness, burning sensations, or other nerve problems. When non-surgical treatment won’t cut it, surgery is often the right choice for patients who are healthy enough. While recovery will take some time and no operation is without risks, neuroma surgeries are highly effective on average and can help you get back to living a normal, pain-free life. Surgical methods can vary depending on your specific situation, but the main goal is to relieve the pressure that the thickened mass of tissue is placing on the nerve. The operation is typically conducted under local anesthesia as an outpatient. For questions, or to schedule an appointment with Dr. Harvey Danciger, please contact our office in Palm Desert, CA online, or by dialing 760-568-0108.